EUGENE STOOP, managing director of Boxer Superstores, says that he has had "an incredible journey with the brand". His passion for the Boxer Superstores success goes beyond profits but is evident in his commitment to the brand's goal of being Africa's Favourite Discount Supermarket, a real understanding of the numerous stores' customers, an investment in the company's employees as well as a vision for the future. Of significance is that Boxer Superstores celebrated its 40th year of operation in 2017. Boxer started its journey as a wholesaler in the very early days but has continued to evolve itself over the years. The company's beginnings were as a family run business; trading in essential commodities such as maize meal, rice, samp, sugar, oil and beans. KwaZulu Cash & Carry was established in Empangeni, followed by stores in Pietermaritzburg and Pinetown. In 1988, a small group of prominent KwaZulu-Natal investors acquired the business. Consequently in 1991, the trading stores were re-launched under the name of 'Boxer Cash & Carry'. 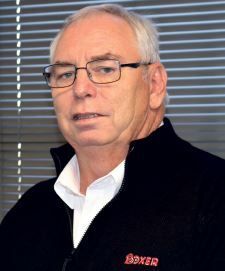 As Stoop's entire early working career had been in the wholesale and retail industry he was offered a position in the then Empangeni based business. After a six-month period, their offices moved to Pinetown to be more centrally located closer to its supplier base. Over the years, Stoop's Boxer journey has seen several highlights, which have marked the evolution of the brand and the growth in the number of stores and divisions. One of Stoop's first priorities was to put structure into this retail business. The company needed a proper buying department and a basic stock control system, which was a big focus area with aggressive roll out plans that was expected from Boxer. Following from that success and on the urging of its customers, Boxer then included butcheries in its offering which were a natural progression and part of repositioning the brand as a retail store." A highlight, Stoop said, was the establishment of a formal administration system in the company. "Computerisation was a big issue for us especially as many of the growing number of stores were in, then, rural areas distant from the head office. Boxer employed an IT specialist who developed the BoMM system (Boxer Merchandise Management System); the core of which is still being used twenty years later." Another noteworthy event was the opening of the first Mtubatuba store. Over the first day the mass of shoppers who rushed in resulted in the store's turnstiles at the entrance being ripped out of the floor and pushed to the back of the store. In addition, the opening day store turnover figure was a record that stood for many years to come. However, growth and change does not happen without stressors. The expansion of the business and entry into other provinces meant a change in the brand identity was necessary. In 1997, a new corporate identity logo was adopted, and the trading retail name was changed to 'Boxer Superstores' to better reflect its role as a retailer. Removing the 'boxer man' totally from the logo caused Stoop some sleepless nights as he was not sure what the response by customers would be to the decision both he and the marketing director made. However, the evolved brand logo was received favourably by consumers showing the brand's strength in the market. "As we have evolved as a brand so have our customers and it has been imperative that we have grown with our customers' ideals and aspirations in order to remain relevant." In 2002, Boxer was acquired by Pick n Pay as a subsidiary and has enjoyed the benefits of its parent company to enable growth while also having the freedom to operate independently. Pick n Pay has fully endorsed Boxer's continued growth in its store numbers and full-service offerings. To deliver on customers' expectations when it comes to stock availability, a distribution centre was establishment in KwaZulu-Natal. Stores are in all provinces of South Africa as well as in Swaziland with room for an increase in store numbers to continue due to customer demand. Stoop concluded, "Everyone talks about change, in Boxer change is constant; we change every day to meet our customers' needs. We are not scared to try new things and to make things better, simpler, more efficient, more cost effective. The journey now is the most exciting time in Boxer's story."